Tune It! Safe! is the name of campaign that has started in Germany where the Department of Transportation and association of tuners (VDAT) wants to promote the idea that also tuning cars can be safe. Also last year on Essen Motor show was introduced a masterpiece in police colors – Porsche 997 modified by TechArt to join this idea of safety. This year Brabus has decided to present its own Tune It! Safe! vehicle. Its famous Brabus Rocket is used as the basis of the project. The Rocket was introduced in 2005 on Frankfurt Motor show and as we know it’s a heavily modified Mercedes CLS 600. And similar as TechArt, also Brabus now is in fancy police colors. It’s the world fastest saloon that can reach 360 km/h speed. The heart consists of the 6.2 liter 12-cylinder engine enhanced with a pair of turbochargers. Thanks to this powerful combination the engine produces 537 kW (730 hp) at 5100 rpm. 730 hp is impressive number but it’s nothing compared to its monumental torque. The torque is unbelievable 1320 Nm, but it’s electronically limited to 1100 Nm at 2100 rpm. Then the power is transmitted to the rear wheels with the 5-speed automatic transmission. This attributes tell that this Brabus is fast as hell. It can reach 100 km/h in 4 seconds, 200 km/h in 10.5 seconds and it needs only 29.5 seconds to reach magical 300 km/h. Next measurements on Nardo circuit have revealed that this hell ride is capable to beat 100 km/h in amazing 3.3 seconds and can run at 365.7 km/h. 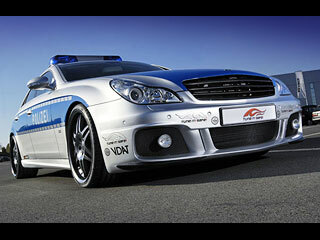 What is your opinion about Brabus Rocket Police Car Tune It Safe! ?